So, we now have nice weather... YES ! How long it will last for I don't know but if like me you suffer from 'Hayfever', being outside isn't necessarily straight forward. Endless reams of tissue and antihistamine on the go can be quite annoying. Here are a few 'Hayfever' essentials that may help you on the way. 1.) Eye Drops - these are great for dry and irritated eyes. 2.) 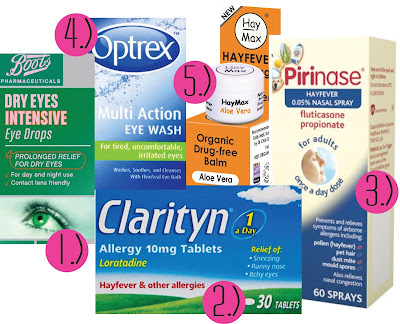 Tablets - There's a variety that you can choose from that can ease the pain of your hayfever allergy. 3. )Nasal Spray - A good relief for hayfever symptoms. 4.) Eye Wash - Refreshes eyes if they get irritated and sticky. 5. )'Haymax'- A balm that keeps pollen away.